I’ve never been to Cebu. I have heard lots of great things about it but I never had the chance to visit. Until Endre came to the Philippines for a month-long stay. Endre first visited Cebu last year during the Sinulog Festival. It was love at first sight for him. Cebu was so remarkable for him that he said he wanted to live there. And learn Tagalog too. Why Tagalog and not Cebuano, I did not ask ;) Endre’s love for the Philippines is so intense that it puts me to shame. A bit. Not so much. But shame nonetheless. Anyway, he told me he’d be in the country around the middle of February and would be happy if we could meet up in Cebu. OK, now is my chance to finally visit so I made arrangements for a weekend trip. It will be a short stay and I will be out for the most part of the day and only needed the basics like a safe and clean place to sleep for the night and a clean bathroom. 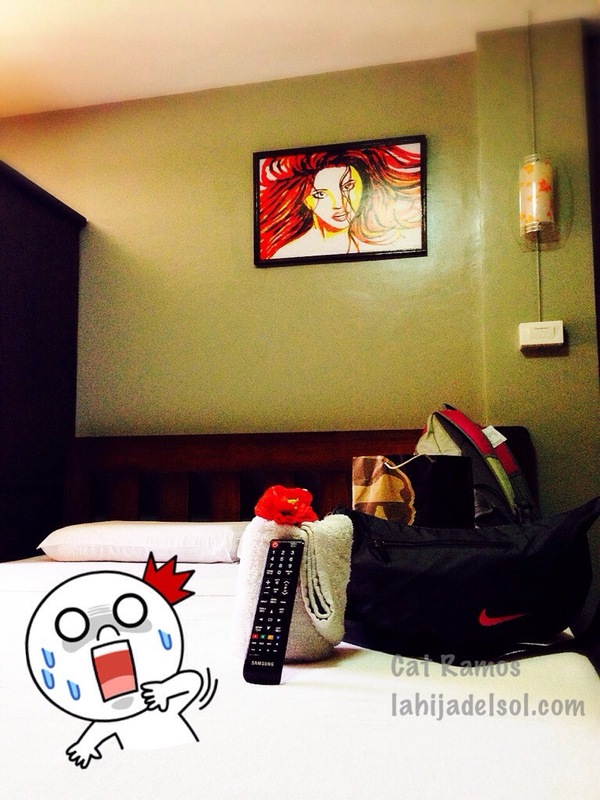 I booked a room at Hotel Europa for P1,200 for one night. 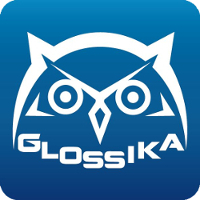 The hotel is favorably rated on Booking.com in terms of accessibility, affordability, and friendliness of staff. I took a 6:10am flight out of Manila. The flight was delayed and I only got to Mactan International Airport at about past 8am. I took a cab to Basak where Hotel Europa is. 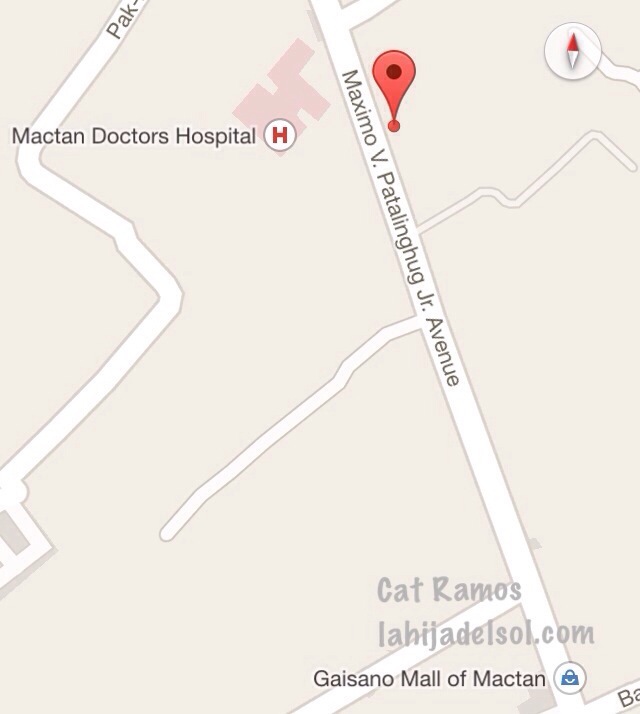 It is very near Mactan Doctors’ Hospital and Gaisano Grand Mall so it is hard to miss. Unfortunately, check-in time was 2pm and my reserved room was still occupied. Lorie at the reception desk was kind enough to keep my backpack for me while I check out the neighborhood. It was still early and Endre was not replying to my texts so I figured he was still sleeping. I went to Jollibee Gaisano for an hour-long breakfast. Heh. A pancake breakfast set can only last you so much. Good thing the coffee was so bitter it took more time to actually drain my cup. 10am and still no message from Sleeping Beauty. I took a walk, heading towards Plantation Bay. It didn’t look too far from Gaisano in Google Maps — and Lorie did say it is fairly near. But after a few metres, I turned back. It was scorching hot! The pilot said ground temperature was 22 degrees. There’s no way that this is 22! More like 32 and climbing. Then the owners started talking in a rapid-fire mix of English, French and Cebuano and I managed to get bits and pieces. I did not mean to eavesdrop — they were talking pretty loudly. Roselyn manages the hotel with her Belgian husband. She studied French for 3 months in Belgium. She quickly picked up the language because she had no one to speak English or Cebuano with. The big advantage of immersion. Well, thankfully, I did not have to wait until 14:00 for check-in (Besides, I have already used up all my French). They gave me the keys to my room as soon as they finished cleaning it. I was so surprised at how large it was. 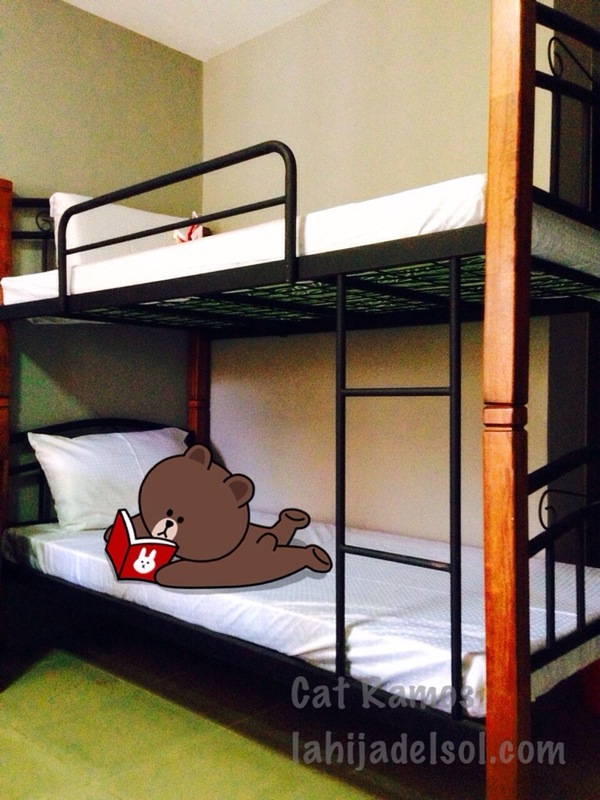 Aside from a queen-sized bed, the room has a bunk bed, so it can accommodate at least 4 people. And I have it all to myself! Dibs on the top one! Oh wait, I am the only one here. And Brown, of course. The room also has a small sitting area with a table and 2 chairs — it just seemed weird to me that they felt the room needed the extra furniture, which blocked the door to the balcony and the closet and the refrigerator and the safety deposit box. What is the point of having all those things when you can’t get to them? I actually hit myself on a chair when I was drawing the curtains. See how the chair blocks the door? The room is has an air-conditioning unit and a flat-screen TV but no phone, so if you needed anything, you have to go down to the reception desk. The hotel does not have its own restaurant or snack bar. But nearby Alberto’s (pizza) and Berenice can deliver food straight to your hotel room. Also, it is a short walking distance to Gaisano Grand Mall, convenience stores, bakeries and sari-sari stores so everything you need is just a few metres away. 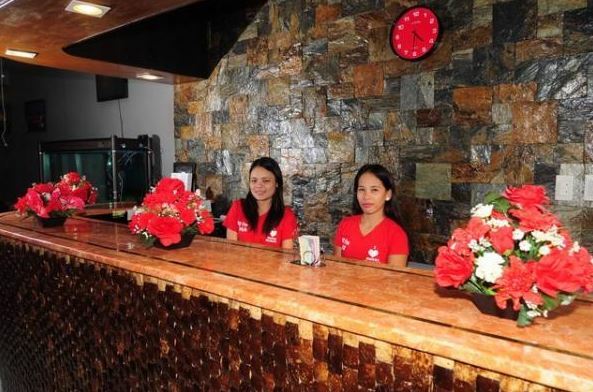 It is conveniently located along the main road and is only several metres away from the shuttle terminal for vans going to Cebu City or Mandaue (P30 fare). Tricycles and cabs are available at all times of the day. I guess I love almost everything about this hotel. But if I really have to nitpick, I would say…remove this painting from the wall! It’s so creepy. I seriously considered taking it down so it doesn’t look like it is watching me. But whatever. So is that scary or what? Also, the towels are old and threadbare, but I did not mind because I always bring my own. Overall, no major complaints. Hotel Europa is exactly what I needed for this trip. 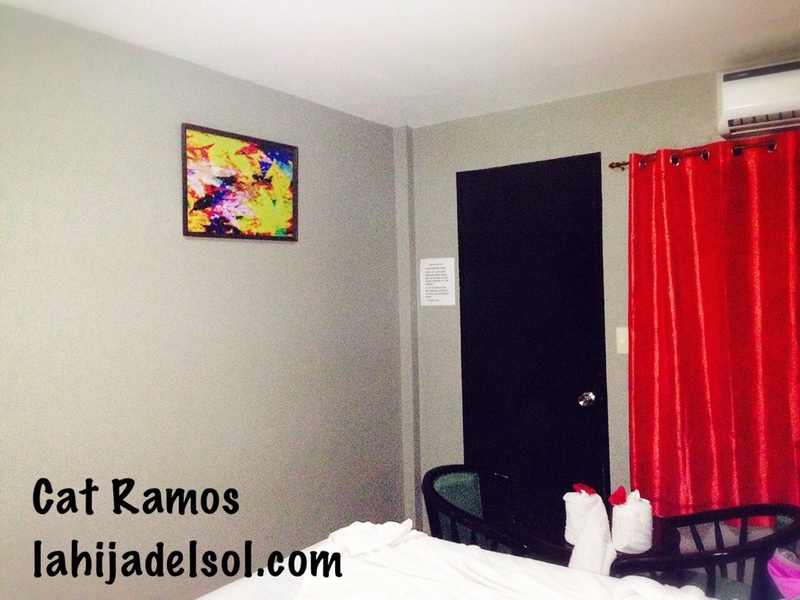 Great value for money, and I recommend this to anyone looking for an affordable place to stay in Lapu-Lapu. My phone goes off at past 13:00 — Endre just got to the hotel to pick me up. Finally! Going out for a Cebu City tour with a Hungarian “tour guide”. Ha! Actually i enjoyed reading this aritice. Because i have stayed in Cebu to escape from japanese tidious situations. Without extreme air pollution, Cebu would be praised by more and more people. After i tried to find English teaches for my retirement in vain, i had my wisdom tooth fixed/filled here and at present i find no trouble about it. Cebu hotel i am staying is quite ugly, because rain fell from the bath ceiling and wifi is quit weak and under credible condition. i envy you for your cozzy room, which looks quite comfortable. 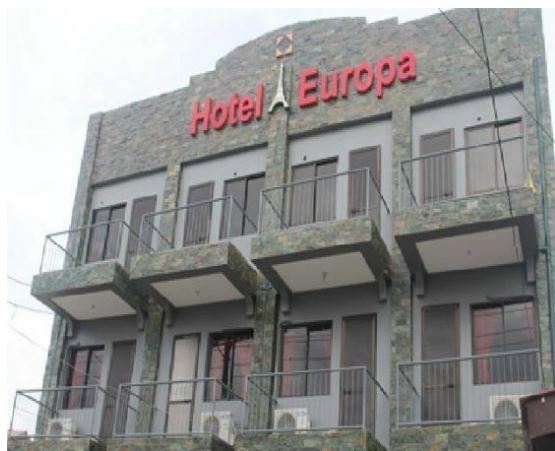 Maybe you can also try staying at Hotel Europa. It is not in Cebu City, though. Hahaha, correct Emelie! Just like in The Ring. We stayed a few days in Manila. It’s a very busy city that offers a great variety of cheap accommodation! Your room is so cozy. I’m glad you enjoyed your stay :)!! Agness recently posted..I Would Rather Go Hungry Than Eat Filipino Food Again! Cebu was great; I want to go back and explore some more. I will publish the blogs about the rest of my trip as soon as I get more pictures.